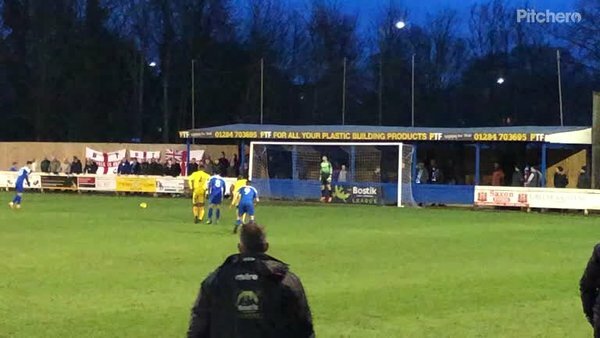 A last gasp equaliser denied Canvey Island a rare three points at Ram Meadow, drawing 1-1 with Bury Town in the Bostik North on Saturday. Manager Mark Bentley named the same side that beat Mildenhall Town a week earlier. There was however a new face on the bench in the form of 18-year-old right back Daniel Francis who joined before the game on work experience from Barnet. Canvey took the lead after only five minutes when Adam Topley sprayed an excellent ball out to Adam Vyse on the right. Vyse played the ball infield for Josh Hutchinson who found the bottom corner with his left foot from the edge of the box. The home side responded well and created a good chance of their own three minutes later. Forward Ollie Hughes set off a positive run down the left, getting past Elliott Warren before crossing to the back post for strike partner Cemal Ramadan. He took a touch and shot, but Sam Collins was on hand to close down the ball and produce a block. Hughes was involved again on 14 minutes, this time cutting the ball back from the opposite flank for Tommy Robinson to strike, although the midfielder leant back to much and fired his effort over the crossbar. The Gulls had the ball in the back of the net again on 18 minutes when Martin Tuohy headed home at the back post from a corner. However, the goal was rightly ruled out after Tuohy had pushed defender Kyran Clements with the ball in the air. Bury Town were back up the other end two minutes later when Cemal Ramadan was played in behind the Canvey defence down the left. Harry Palmer came off his line but failed to get the ball, although did manage to force the forward wide. Ramadan chipped a shot over Palmer but the ball was cleared off the line by James White who had retreated back. The home side looked to have equalised shortly into the second half when a cross from the right was headed towards goal at the back post by Ollie Hughes. The ball looked as though it was heading in, but lightening fast reflexes from goalkeeper Harry Palmer saw him claw the ball off the line. The attacking players were convinced the ball had crossed the line, but neither the referee or his assistant were in agreement. They had another chance on 54 minutes when a cross was clipped over from the left for Cemal Ramadan, but having timed his run in behind the Canvey defence he found himself off balance and skewed his shot wide of the target. Canvey then came close to doubling their advantage on 61 minutes when Sam Collins jinked is way on from the right wing to the edge of the box. Collins unleashed a superb left-footed drive which was tipped over the bar thanks to an equally brilliant save from goalkeeper Luis Tibbles. The Blues were awarded a penalty on 77 minutes when debutant substitute Daniel Francis fouled an opponent inside the area, seconds after Harry Palmer had made an excellent one-on-one save. Cemal Ramadan stepped up but smashed his spot kick over the bar. However, Ramadan’s blushes were spared in the final minute of injury time when Bury Town were awarded a corner. A good ball was whipped in to a dangerous area and headed home by defender Kyran Clements to secure a point for his side.